Astrowright, I note that you have commented on Stephen Goddard’s post, Hyperventilating on Venus. I replied, thanking you for your post and asking several follow-up questions. I also note that you have not answered. An answer would be greatly appreciated. 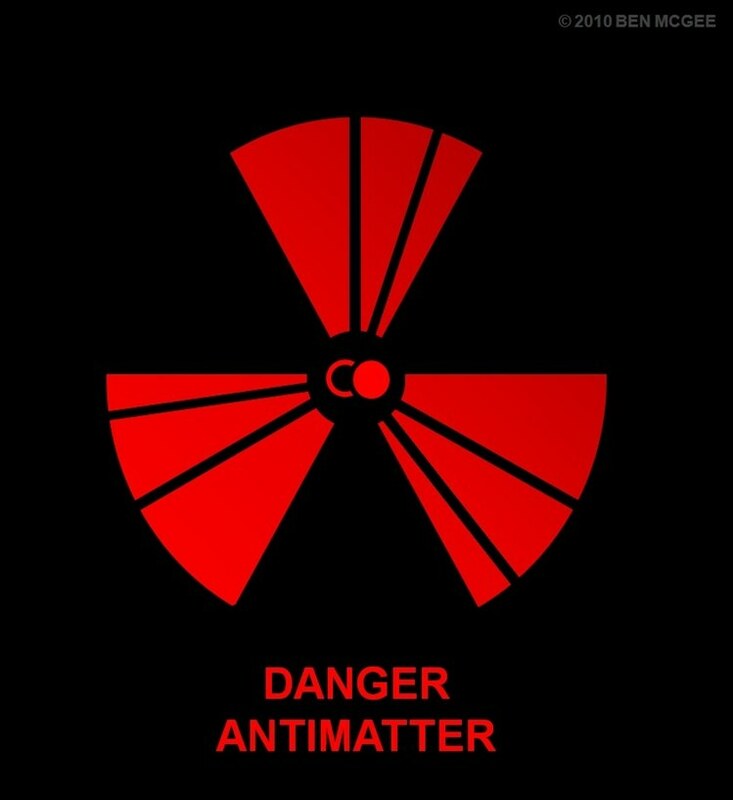 PS – I like your anti-matter hazard symbol, it is well-designed and eye-catching. Thanks re: the antimatter symbol. I know people may see it as premature, but should we find a more efficient way of producing it in large quantities, (or simply a more efficient way of generating energy such that wasting 90% of it to create antimatter is no big deal,) we’ll be off to the races! Let me know if you have follow-on questions, and keep fighting the good fight! astrowright, the thing about antimatter is that it is not an energy source. Instead, like hydrogen or electricity, it can only be an energy transport medium … and considering the difficulty in transporting it is even greater than that of hydrogen, it will be a while before we see it being used. But on the other hand, all we need is an antimatter mine (and antimatter miners with antimatter shovels) and we’re home free. And, yes, it’s difficult and expensive to run your antiproton decelerators and sustain Penning Traps, etc., etc., which is why I imagined some would see this as premature. -But I’d like to make the counter-case that difficulty doesn’t mean with a little push (a’ la Manhattan Project) it can’t be used as the core of a (space = microgravity) power system. It is difficult to manage uranium for reactors, too, but we’ve managed in a very short period of time to discover, refine, enrich, and take advantage of it as a power source. I was wondering if anyone had come up with a symbol for antimatter (star trek maybe) when I found your site. I did find another one that appeared in many locations, but I like yours better. My suggestions for “improvement” would be to somehow include in the center, a place for the atomic symbol of what type of antimatter is involved. As you know the symbol for antimatter is just the same symbol with a bar over the top. Perhaps the one you have created would be the generic symbol when the exact element is unknown, or maybe you could squeeze both of the symbols in the center somehow. For more visual appeal I would also offset the bisection of the red arms to one side or the other. I have no scientific basis for this. I just think it would look cooler. Finally, I am a real fan of the yellow and black theme since it is well established. Red is fine too, but I don’t like it on a blue background. Again, just my opinion and I’m certain others would disagree. Thanks for your suggestions! I seem to remember spying in the newest Star Trek film what appeared be an antimatter symbol on huge tanks in the Enterprise’s engine room. If memory serves, the symbol was a modified “standard” radiation trefoil with large arrows pointing outward from the spaces between the foils, but other than that I can’t think of anything definite for competing symbols in the sci-fi spectrum. As for including a specific antimatter element symbol, why not? I tend to think of these symbols as more general in nature, (e.g., our current radiation symbols don’t include which radioactive elements we’re dealing with – plutonium? harmless potassium?) but in my view more information is always better. Maybe that’s an idea current warning symbols should take to heart as well. I wasn’t married to the dark blue background, either. (Ironically, it was intended as a throw-back to the original color scheme proposed for the radiation symbol back in the day.) 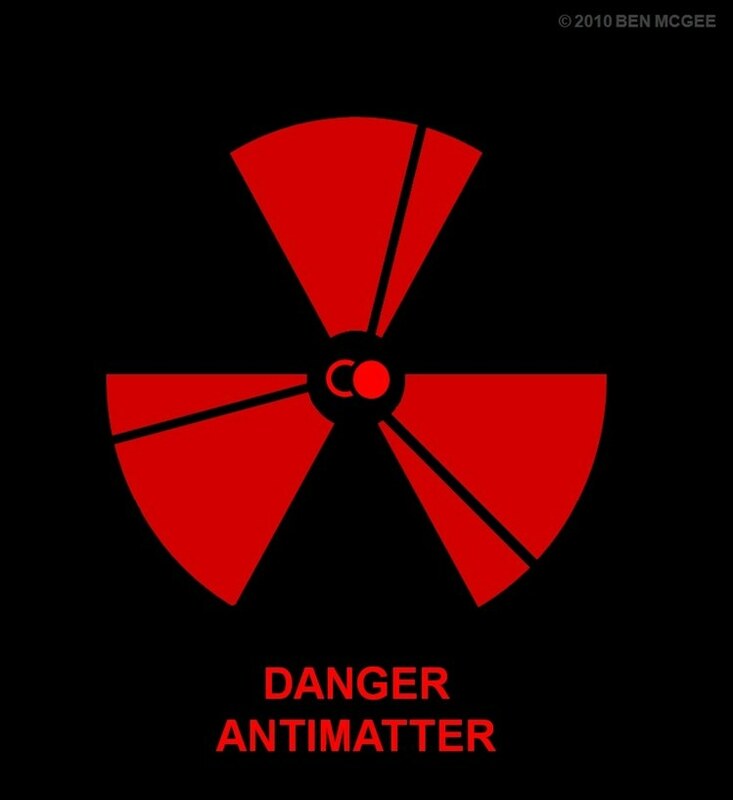 It was my intent to differentiate antimatter from “normal” radiation at a glance, so I’d like to avoid the exact same color scheme, (and red seems more serious than yellow,) but maybe you’re right that a black background is really the way to go. This most certainly helps! Thanks sincerely for reading and commenting! I like the black a lot better! 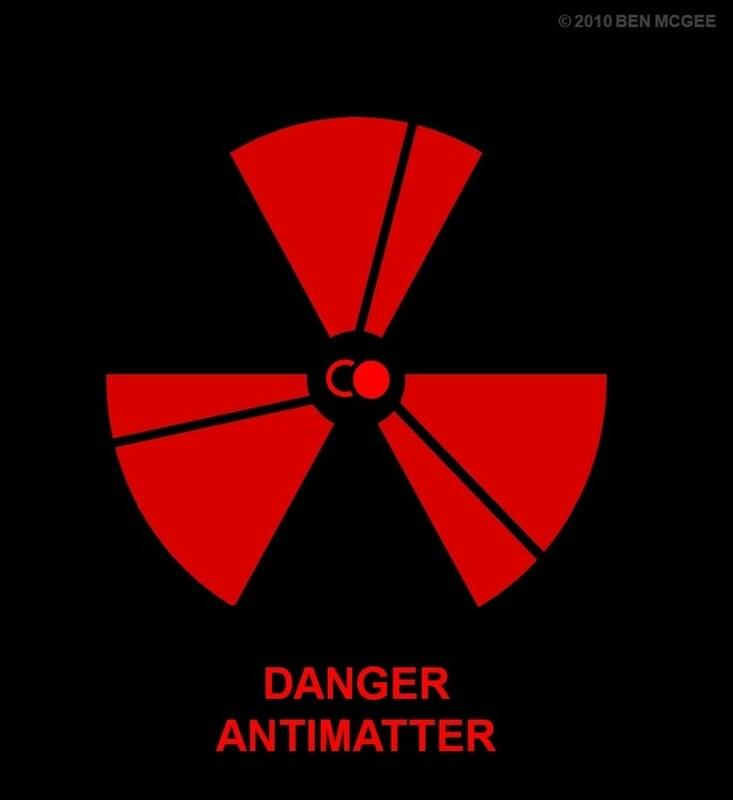 The suggestion for which element the antimatter is based on actually came from real warning symbols, but chemical warnings, not radiation warnings. You can see some ideas I had at the following links, although now that I look at them, I think maybe bisected is better. I think it’s really cool that you created this. I like you symbol for warning of anti-matter and I would like your permission to use it on a virtual product I am developing in the virtual world of Second Life. This product would be an anti-matter containment pod. By all means – I would be pleased for you to use the symbol! 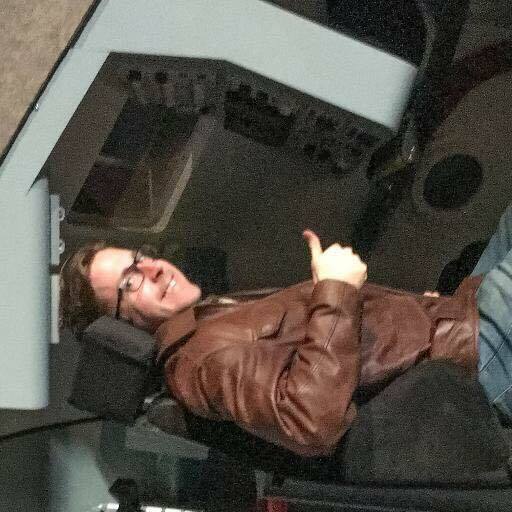 All I ask is that when you finish the antimatter containment pod, please email me a screen grab of the logo in action on your pod for my records. timescientist at gmail dot com is a suitable email for you to use. Thanks for reading and for promoting the symbol! 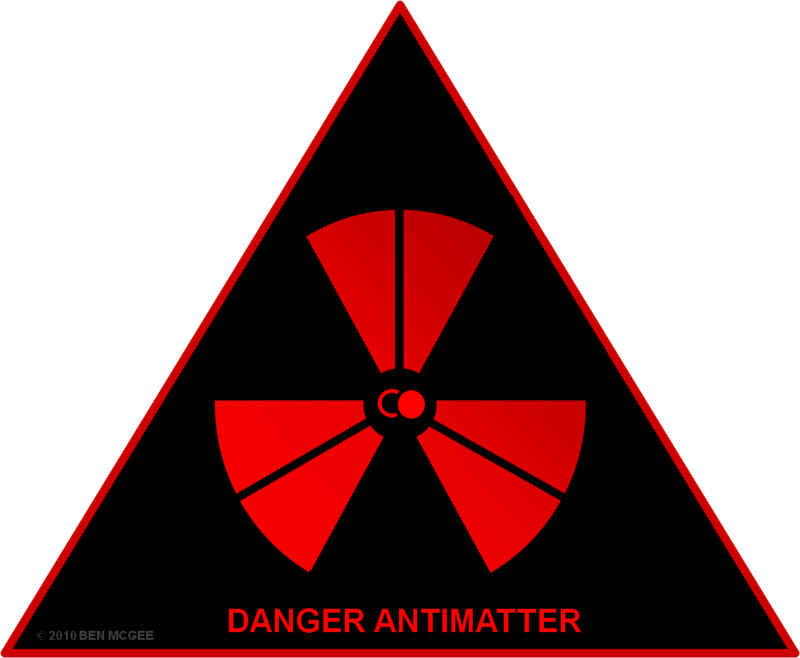 Here’s my version of your symbol… in the black-and-red “warning label” form that would be painted onto anything carrying Antimatter. I like what you have done for the sign in your version. Great work. I actually like the blue/red combination better. The eye has a “problem” with the edges of blue-red regions which gives them a sort of “vibrance” that stands out. Some might find that annoying or unpleasant. That might not be a bad idea. Sometimes you see an ancient tail-light design on the road that had a red lens with a small blue disk or spot in the center. Same effect there.